On Monday, April 5th, 30,000 people from all 50 states and DC will visit the South Lawn of the White House for this year’s Easter Egg Roll. This year’s activities will reflect the theme, ‘Ready, Set, Go!’ which follows the First Lady’s Let’s Move! initiative – a national effort to combat childhood obesity. Numerous singers, entertainers, chefs and athletes will participate in this year’s event – the largest annual public event held at the White House. · Chef Art Smith, Chef José Andrés, Chef Cliff Wharton, Chef Nora Poullion, Chef Robert Wiedmaier, Chef Susan Limb, Chef Victor Albisu, and the White House Chefs will prepare healthy eating demonstrations in the Play with your Food station. · For the second year in a row, tickets were distributed online, allowing for more guests from across the nation to attend the event. For the first time, guests from all 50 states and DC will have an opportunity to attend. · All of the headliner music acts and Storytime Stage readers will have their performances broadcast live on www.whitehouse.gov/eastereggroll. A full schedule will be posted on the morning of April 5th so citizens from across the country can participate in the event. · The White House has extended this year’s event, with a start time of 7:45 AM and an end time of 5:45 PM. 30,000 tickets have been distributed in 5 different groups. Each group of 6,000 guests will be able to spend two full hours on the White House’s South Lawn. · An entertainment pavilion has been added to the ellipse so guests can enjoy musical acts and activities as they prepare to enter the South Lawn. · A more ambitious and comprehensive approach to sustainability was taken to minimize the environmental impact of the 2010 Easter Egg Roll. Some of the highlights include: the “greenest” souvenir egg in Egg Roll history, crafted from Forest Stewardship Council certified U.S. hardwood; goody bags made from 100% post-consumer recycled plastic; the use of organically grown fruits and vegetables at the Play with Your Food station; and increased recycling and composting capabilities on the day of the event. 15) Family Farmer’s Market – a look at healthy eating with celebrity chef demo stations. 22) Books that will be read on the Storytime Stage were checked out from DC public libraries. And they will all be returned on time! 50) Many volunteers will arrive for their shifts as early as 5:00 AM to help get the Easter Egg Roll rolling! I wish I could be there! Miss Amy is a family favorite and she really get the kids up and moving. Very exciting to see Miss Amy will be participating. She’s so great at promoting health and fitness in a fun way with music!!! 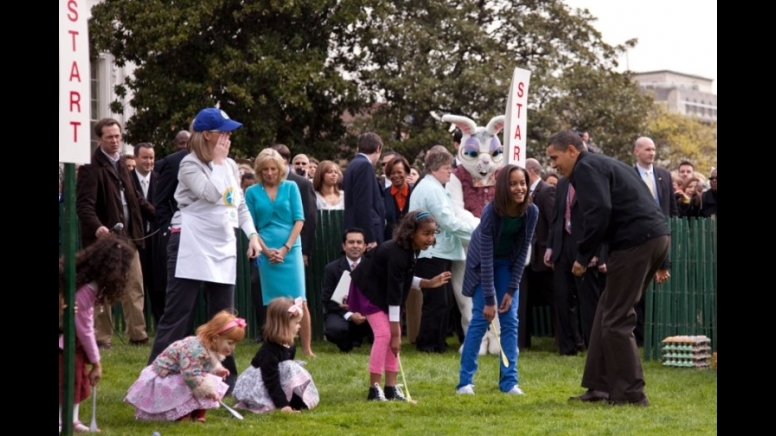 Noticed Miss Amy on the agenda at the White House Easter Egg Roll… those children will have a blast!! She is high-energy, a lot of fun, and we learn something new about fitness every time we see her! We use her music in our elementary school as a special treat to get the kids moving. She’s the best! Should be a fun event! Apolo Ohno was cruising in the Olymipcs, nice he can be there. My kids love that Glee stuff too. Miss Amy and Apolo….bound to be a great day! Both fitness gurus for kids.